2008 Arnulfo D. Trejo Librarian of the Year! I am humbled and honored to receive this award. I don't see myself as a Reforma superstar as I see a lot of other members achieving goals and on their way to achieving goals significant to Reforma's mission. As a member for some 26 years or so, it has been a pleasure to help out whenever possible and meeting and working with many of you has been the reward. Having known Dr. Trejo (Arnie) over the years and receiving the award recognizing this leader of leaders in librarianship, I can only say that "I hope that I am doing okay Arnie." I also share this award with my early mentors. Certainly I would not be a librarian today if it wasn't for Karin Duran and Albert Tovar. They inspired me in 1973 and 1977 respectively. 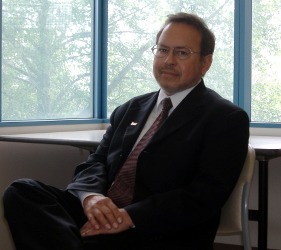 John Ayala (EPDR) sparked an interest in the managerial side of academic libraries and that is still quite alive! I could name many others and you know who you are! I sincerely thank Janice Greenburg and all the members of the LOTY Committee and the REFORMA Board. See many of you at ALA and don't forget RNC III coming up! The committee wishes to thank the chapters and individuals who submitted nominations.